And the winner is... Carey Lowery! What does that have to do with EndlessBikeCo? I was the 4th woman across the finish line, and the only one to race a single speed. PODIUM! I took 1hour and 15 minutes off of my time from last year. 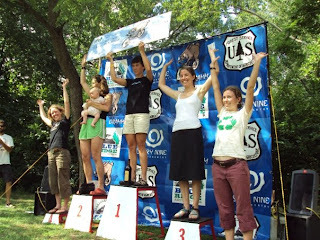 congrats Shanna, just be glad you didn't get 2nd, Todd was giving out Babies this year, Men's SS 2nd ? Baby! man that was a bullet dodged nice work!